The ruby’s intense and deep red colour is highly desired right across the world. 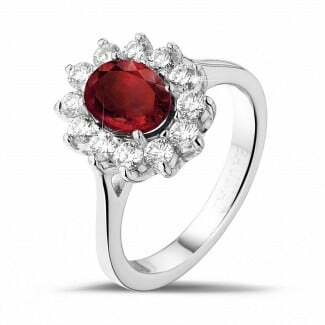 This beautiful gemstone can’t just be easily combined with other coloured gemstones thanks to its timeless shades, ruby jewellery is also classy and timeless. Plus, you can easily combine it with white gold, yellow gold, red gold and platinum for your ideal and personal look. Find your favourite ruby jewellery in our collection. With BAUNAT you will always be opting for top quality and exclusive quality. Each piece of ruby jewellery, diamond or other gemstones will be personally made for you by hand. This ensures you can always rely on the greatest care throughout the entire process. Plus with BAUNAT you will always be able to enjoy an unbeatable price-quality ratio, with prices which are 30 to 50% lower compared to a traditional physical jeweller. What if I can’t instantly find the perfect piece of jewellery in the collection of ruby jewellery? Then you also have the option of easily having the jewellery of your dreams tailor-made. Our jewellery experts will assist you from the very first contact, right through to long after you have received your jewellery. Can I receive guidance when choosing my ruby jewellery? 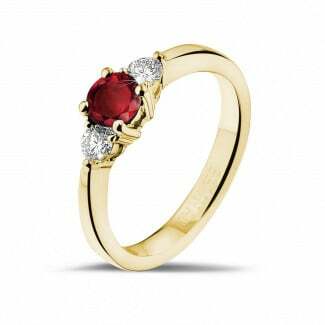 Are you not entirely sure whether ruby jewellery is the right choice for you? Do you not know where to start where your own design is concerned? Then you can always count on our jewellery experts’ support, both online as well as by appointment in one of our specialised showrooms. This will ensure you can always be sure of your choice and you will be able to continue to enjoy your exclusive jewellery without any concerns. 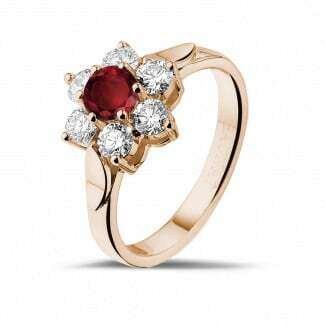 Can I buy my ruby jewellery online? BAUNAT’s complete and extensive collection can be consulted online in the greatest detail. You choose the jewellery of your dreams, select the right carat and look at it into the finest details. Plus every piece of exclusive jewellery is subject to a 30 day return policy and our 20 year product guarantee. Found it? Congratulations! Then your favourite jewellery will be sent to your home fully insured, or sent to one of our showrooms. Find the ruby jewellery of your dreams in our collection and dream away with the deep red shades of your beautiful jewellery.